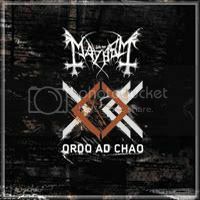 Season of Mist has set an April 23 release date for the new MAYHEM album, "Ordo Ab Chao". A track from the CD, entitled "Anti", is available for download at this location. Commented guitarist Blasphemer (a.k.a. Rune Erickson): "The sound is raw and powerful, and listening to it, it reminds me of the 'Wolf's Lair Abyss' era, only more varied and more philosophical. The album also contains the most aggressive songs in the MAYHEM history as well as the most wicked and darkest." The upcoming CD will mark MAYHEM's first release since 1993 with vocalist Attila Csihar back behind the microphone. Csihar rejoined MAYHEM in November 2004 as the replacement for departed singer Maniac (real name Sven Erik Kristiansen).